-NZD slides as RBNZ snuffs out last hopes of a 2018 interest rate rise. -RBNZ says will hold rates at 1.75% for "a considerable period of time". -NZD/USD now down 6% in one month alone, GBP/NZD up 1.67%. The New Zealand Dollar fell broadly on Thursday after new Reserve Bank of New Zealand (RBNZ) governor Adrian Orr used his inaugural meeting and press conference to snuff out any last remaining, die-hard hopes of a Kiwi interest rate rise at any point in the near future. It goes almost without saying the RBNZ held its cash rate at a record low of 1.75% for 18th month in a row Wednesday evening, citing continued weakness in domestic inflation, which is running beneath the midpoint of the Bank's 1% to 3% inflation target. The rub for markets was in the governor's opening remarks at the beginning of the May monetary policy statement. "The Official Cash Rate (OCR) will remain at 1.75 percent for some time to come. The direction of our next move is equally balanced, up or down. Only time and events will tell," Orr writes. 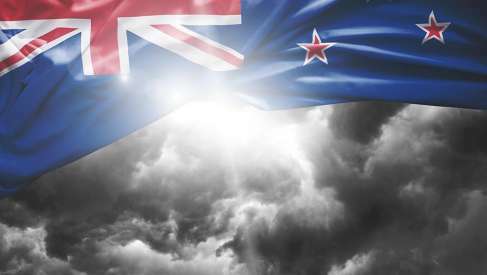 Markets had been looking for modest tweaks in the bank's long term interest rate forecasts, which might have buoyed the Kiwi Dollar, and for the RBNZ to avoid any language that would suggest interest rates can still go downward. As a result, the governor's actual statements came as a negative surprise for the Kiwi. "Emerging capacity constraints are projected to see New Zealand’s consumer price inflation gradually rise to our 2 percent annual target. To best ensure this outcome, we expect to keep the OCR at this expansionary level for a considerable period of time," Orr told members of the press. "This is the best contribution we can make, at this moment, to maximising sustainable employment and maintaining low and stable inflation." Currency markes care about the RBNZ because interest rates are the raison d'être for most moves in exchange rates. Changes in interest rates, or hints of them being in the cards, are only made in response to changes in domestic inflation but impact currencies because of the push and pull influence they have on international capital flows and their allure for short-term speculators. The NZD/USD rate was quoted 0.03 lower at 0.6927 during early trading in the London session Wednesday, after falling close to 80 points overnight, which has taken the pair's loss to -5.99% in the last month alone. The Pound-to-New-Zealand-Dollar rate was 0.15% higher at 1.9567 and the AUD/NZD rate was up 0.27% at 1.0785. "As much as we remain of the view that the RBNZ should be getting ahead of the curve with a positive output gap and full employment ahead of the expansionary fiscal policy onslaught, we push out our first RBNZ +25bp hike from November to February 2019," says Annette Beacher, chief Asia Pacific macro strategist at TD Securities. "In FX, our colleagues prefer to stay defensive on the NZD, with Orr not giving any reason to hold the currency just now." Thursday's price action comes as the US Dollar eased broadly in a "buy the rumour and sell the fact" response to President Donald Trump's decision to withdraw the US from the so called Iran nuclear deal. This provided broad support to so called risk currencies such as the Aussie and Canadian Dollars while penalising safe-havens like the US Dollar and Japanese Yen. However, the Kiwi was conspicuously absent from the list of risers Thursday morning as remains under pressure against all developed world rivals. This marks a continuation of a recent trend that has seen shifting interest rate dynamics in global bond markets force the Kiwi Dollar's onto its back foot in recent weeks, as the support from higher relative bond yields that was traditionally enjoyed by the currency has been increasingly undermined. US 10 year yields have risen steadily in 2018 due to an increase in the supply of American bonds and as markets continue to flirt with the idea that the Federal Reserve will raise its interest rate at a faster pace in 2018. This is while the Kiwi 10 year yield has fallen from 3.4% at the beginning of 2017 to just 2.78% in May. Above: 10 Year New Zealand Government Bond Yield. These changes mean investors can now earn a higher return by selling Kiwi Dollars and buying the greenback in order to park their money in the American bond market - the opposite of how the so called "carry trade" used to work. And with US bond yields expected to continue trending higher for some time to come, the Kiwi looks set for even further losses during the months ahead now Governor Orr declined to provide it a lifeline Wednesday.